Vogue Crafts & Designs Pvt. Ltd.: Amazing ways to make a diamond look larger! Pay attention to your diamonds clarity, the more you see your diamonds clarity the brighter and larger effect this would give to you as a ring. As they say the more it sparkles, the big it appears! Look out for fancy diamond shapes; this also gives your diamond a unique and charming look! The different diamond cuts like square, rectangle, square, etc not also makes it look unique but also gives it a larger effect and wow! You end up buying diamond of as larger size! You can also look out for Halo setting; this type of setting, the halo ring is a setting that encircles a center gemstone in a collection of round pave or micro-pave diamonds (or faceted color gemstones). These pave stones flash with light and focus attention back on the center stone to create interest and draw people’s gaze to your ring. This would make your gemstone look bigger! 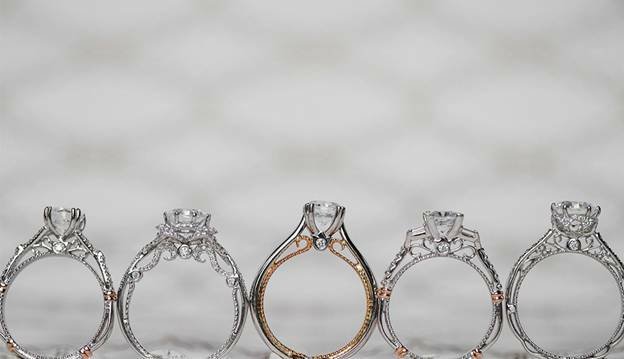 Also opt for Platinum setting or white gold, because white gold or platinum will blend with and enhance a white diamond, making it appear larger. A yellow gold setting can throw a yellowish tint back onto the diamond. Look for diamond enhancer; these are pieces of jewelry sold separately from your diamond ring or earrings. The earring enhancer is a thin halo setting the slides underneath your solitaire diamond earrings. 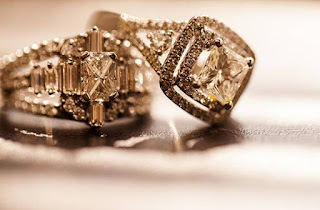 Diamond enhancers for rings are essentially a cradle that you set your solitaire diamond ring into. It adds top and bottom interest to the solitaire, making the overall ring appear larger. Choose a thin band for the ring, if you have a very small diamond ring; don't mix it with a very thick wedding band with larger scaled diamonds. Keep it thin and simple with small pave set diamonds. One diamond on either side of a center diamond makes a beautiful engagement ring! Try it if you don’t trust me! If you want the main stone to appear larger in a three stone ring, have the accent stones be half the size of the main stone.